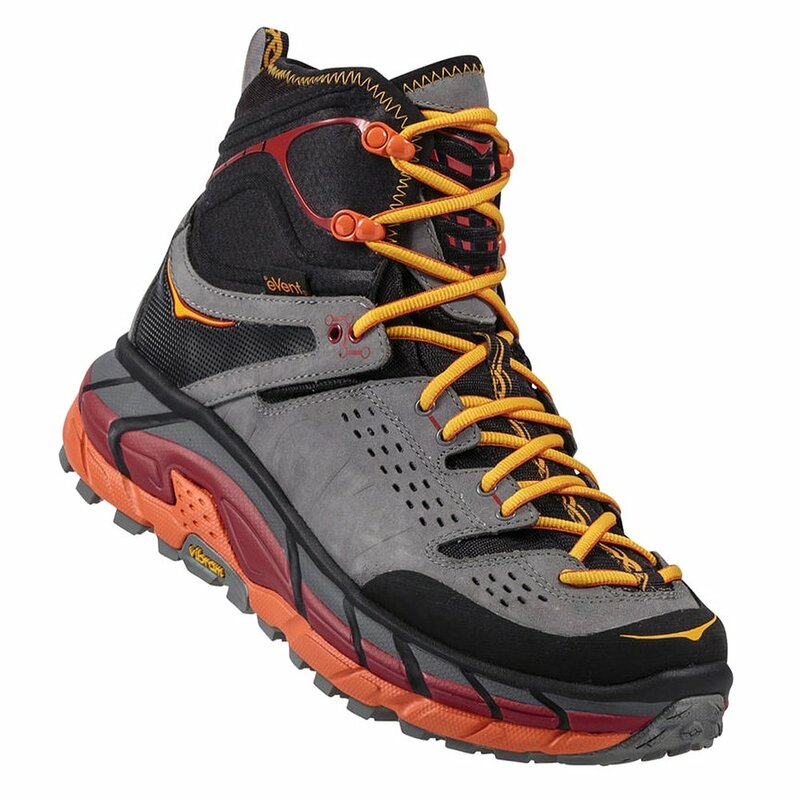 You know them as the makers of cushioned and comfortable running shoes, but the HOKA ONE ONE Tor Ultra High Waterproof Hiking Boot lets you bring that technology to the mountains. Featuring an eVent® waterproof bootie that is fully waterproof and extremely breathable, you'll be able to reach any summit in any conditions without compromising on the comfort and support provided by the EVA and RMAT® midsole. And on the way back down you'll appreciate the support provided by the sturdy suede and nubuck construction that rises above the ankle for better protection. Review 2, Mt Whitney Hike!!! This is my second review after having these boots for a little over a month. I've hiked at least 100 miles so far on some rough terrain. Mt Wilson, Mt Baldy, and now Mt Whitney. I did 18 miles on my Whitney hike in one day, up 3500 ft, down 6000 ft, on some of the roughest rocky terrain I've been on. I slipped maybe twice, had a couple of times where my ankle rolled, and had a single blister. Honestly I don't think the boot exists that will make your feet feel perfect after a hike like I just did, but these were the best so far. boots could have a little more room in the toe box and I find it hard to get them tied in such a way as to really keep your heel in place when you are going downhill. Still, I was in pain after the hike, but have recovered after a good night resting. Ankle support, great. Traction, great. One bad thing is that the soft sole might not handle the repeated punishment of the granite of the high Sierras like some other shoes. I wore them down some and the sole seems to be very weathered in places. Time will tell. Overall, these are great and I can't wait to see what else these guys do for my feet with their products. Was bummed after lugs started coming off the sole after the first 5 mile hike! The boots were incredibly comfortable and stable. I REALLY want these to work because the max cushion is really helpful to me on longer hikes(10+ miles). So I may just try and super glue pealing sections of the sole down and live with it? But for $200+ thats a hard pill to swallow. Maybe these are only meant for easy dirt paths? This is a great light weight hiker that is perfect for most backpacking & hiking applications I do in Alaska. I would not use them if hiking miles of sharp glacial moraine rock, but they will be great for everything shy of that. This is my second pair. I reluctantly tossed my first pair after approximately 800 miles (including at least a dozen 25+ mile days. The laces needed to be replaced after a few hundred miles, which Hoka provided for free. The shoes ultimately lost much of their water repellency, but the primary reason I replaced them was because the tread was shredded by excessive exposure to talus and scree while traveling off trail in the High Sierra. I figured they were done after a 10 day through hike of the John Muir Trail in 2015, but my original pair lasted for three more years. These are, without a doubt, the finest pair of hiking footwear I have ever had the pleasure of putting on my feet. Comfortable right out of the box with no break in required. Impossibly night. Incredible traction. Precise lacing options. The only drawback to note is that the shoes are fairly water repellent out of the box - but only below the laces. Full submersion above the laces can lead to a very hard to dry soaked boot, so ford accordingly! Also, I am typically a size 11 but am a size 11.5 (US) in this boot. The bottom line is that this is a fantastic boot and a tremendous value, even at the price point. I wholeheartedly recommend. My favorite all-purpose boots. Hope the tan color stays in production and more color combos become available. An all-gray combo would be nice too. Was looking to reduce impact under pack loads. Hoka sole cushioning and adapting gait to make use of rocker sole did dramatically reduce impact and relieved sore ankles. The caution I would offer prospective buyers is that the sole is not uniformly stiff. I think this results from the way the fabric under the outside edges of the foot bed curves up into the side wall with a large radius. This produces greater pressure under the outside edges of the foot than elsewhere. With 45 pounds and a hour of hiking this pressure became a painful nuisance. Several attempts at break-in and better foot conditioning did not alleviate this effect. For heavy loads I'm inclined to favor a perfectly flat and uniformly stiff sole associated with more traditional hiking boots. I think the best use of the boot is for trekking and situations where the load is around 25 pounds or less, although I have not explored the exact weight break point at which the sole stiffness becomes problematic. I intend to keep the boots but will not use them for longer backpacking trips. Without a heavy pack, I find them to be comfortable, effective at reducing impact, stable and secure. I got these just before a trip to Peru to hike to Machu Picchu 4 years ago. I wore them about a week before the trip and immediately fell in love with them. My wife and I hike 50+ miles that week and jogged in these about another 40. Yes they are light enough to jog in. Excellent comfort and no break in made these the perfect all around shoe boot for the trip. I've since logged probably 1000+ miles on them and it's finally time for a new pair 4 years later. I will be happily making that purchase shortly. I love this shoe but it is a little wide. It is a well built shoe and light. Difficult combination to find. Please bring back WIDE sizes! So miss this shoe as regular fit is just too narrow for me. I have had these hikers for over 2 years now and I cannot say enough of how this particular pair of hikers has helped my feet, legs etc! I walk every day 10 miles I'm 67 years young ! Will definitely be buying another pair soon! Don't QUIT MAKING THIS !!! Best hikers I have ever had!! Also for walking I just purchased the Hoka Gaviota! To early to rate as they are new, but so far really great shoe! However to my previous review, I'm a huge fan of Hoka and have worn Hoka's for years. Love each and every shoe I've every purchased from you but the boot just wasn't going to work for what I needed it for. I'm hiking Kilimanjaro and need something a bit more sturdy. Thank you for being such a fantastic company and phenomenal return policy. I will be back many many more time for trail runners. I wish that Hoka would once again make these in wide. I've moved to the Bondi 5, which is a great shoe as well, but it's not waterproof, and doesnt have as good traction for hiking. Please consider making this boot in a wide width! They fit true to size, ( I have a slightly wide foot). So if you wear Sketchers or New balance normally they will fit fine. Walking the dog and to work is where I wear them. Some off road involved and mud. I hosed them off well and did not feel any moisture. They are so un-waterproof that I have mud smears on my socks from the toes to halfway up my foot. I do a lot of trail running, especially in the winter. These hightops have great traction, comfort and keep the snow /ice out. My feet feel so luxurious in them, even after a long run. Absolutely love the Hoka 1 brand, they have been a blessing for my feet. I have neuroma in my left foot and wearing any other brand just seems to inflame the nerve. I can wear the Hoka's all day with no pain. Have been wearing Hoka 1 brand now for about 3 years and just purchased my 2nd pair of boots. The first pair lasted me just about a year and probably should have been replaced a little earlier. My only real complaint is, I can't get the all black and the other colors are out of stock on size 13 limiting me to only 1 color to purchase. Also would be nice to see some kind of sale once in awhile. Other than that Love these boots. PLEASE PLEASE PLEASE bring back the all black version. There are more comments requesting these so I'm not alone. Some people require all black for their job and these were the best but I can't wear them in any other color!